Map showing the area covered by the evacuation order. 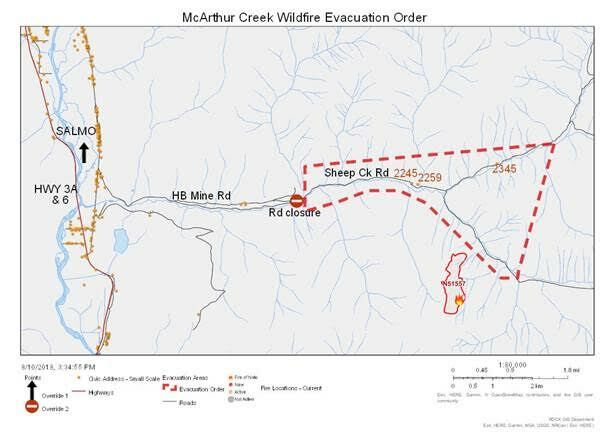 The Regional District of Central Kootenay has issued an evacuation order for Sheep Creek Road, southeast of Salmo due to the McArthur Creek wildfire. The fire has grown to 56 hectares. 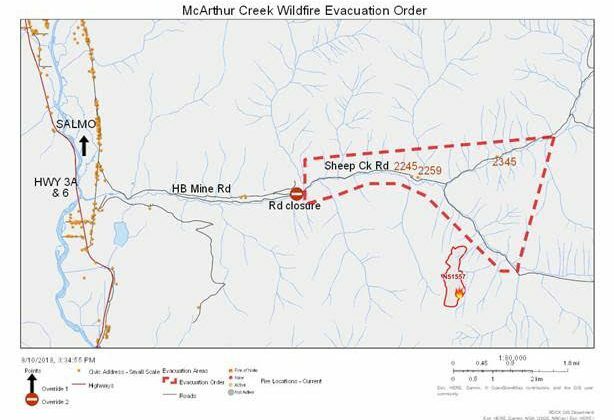 The RDCK says given the fire and forecast, the Southeast Fire Centre recommended an evacuation alert for three homes on the road issued Wednesday evening be upgraded to an evacuation order. With concern for homes in the affected area, the BC Wildfire Service asked the RDCK to deploy structure protection units. Crews have been deployed from RDCK fire departments including Balfour, Beasley, Ootischenia and Tarrys. Sheep Creek Road at the Aspen FSR junction is closed. No public access is permitted on further sections of road.